I am SO excited to be sharing this ADORABLE patriotic ice cream party with you today. Stephanie is my dearest neighbor and friend…and also the reason my soft serve cravings have all been fulfilled this pregnancy! :) I can attest that her ice cream (DooDilly’s Soft Serve) is the absolute best and oh so delicious. The details for this party are so amazing and simply perfect for summer. Enjoy!! I Scream! You Scream! We all Scream for SOFT SERVE! Summer is here! And that means…ICE CREAM season! Not too many people are going to be grouchin’ when you break out the popsicles or drumsticks. And while I love my ice cream sandwiches, sometimes the occasion warrants something a little more… fancy! Today, I am going to show you some eye candy inspiration for personalizing your own SOFT SERVE ice cream party. It is SO super cute and easy and can be made on a budget! Here’s our patriotic table my sister and I put together for Memorial Day. We planned on doing the party outside, but the weather was windy and we didn’t know if it would rain, so moved it inside. We made our first attempt at a ribbon wall to create a fun backdrop. We used cream and white ribbon as a base so that we could switch out the red and blue ribbons with other colors to personalize it for other parties. So basically, my theory is to try to buy things that you can use for other parties. We bought these cute white yogurt cups in bulk, but then I personalized them with washi tape to make them pretty and coordinated. 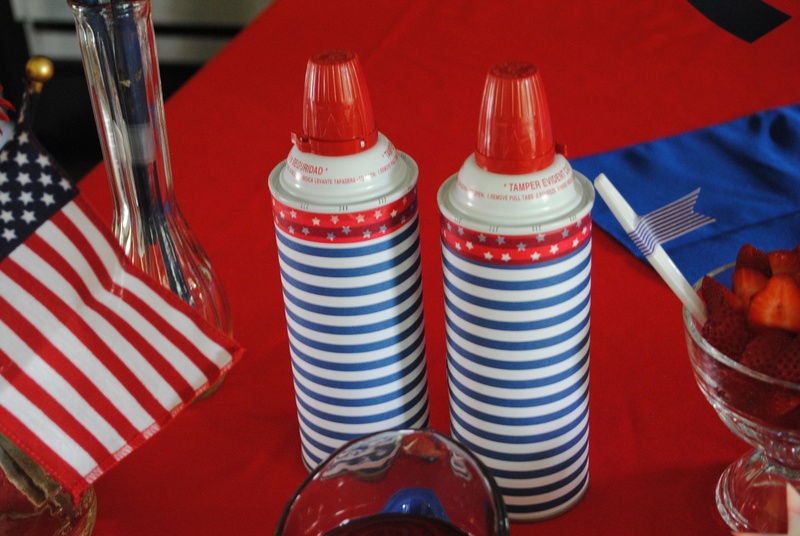 Using plain white cups has given me more options for personalizing them future parties and I won't be stuck with several pre-printed patriotic cups that I couldn’t use until the 4th of July or next year. We wrapped the whipped cream cans in a couple pieces of scrapbook paper and sealed them with a strip of washi tape. We bought plain white spoons and then accessorized them a little washi tape flag. We got a couple different kinds of cones and dipped them lightly in melted white chocolate and then dipped them in patriotic sprinkles. The kids LOVED these! Some adults used cones too, but many opted for the cups so they could load on the toppings. We served both fresh fruit as well as “treaty” toppings. So at the end of the day it basically comes down to this: Soft Serve Ice cream just makes people happy! (and leaves some boys feeling like super heroes). What a cute party idea! i love that last picture. Ah! How fun. This is such a great idea. I want to rent an ice cream machine from you! Now I just need to throw a party... lol. This looks like so much fun! What a great idea! So fun! Frozen yogurt would make the party awesome.